How a change of letters can make a whole lot of difference! Like, replace DTS and STS with XTS and you have an exceptional all-new Cadillac flagship. Under the hood of the large and well-appointed 2013 sedan resides a direct-inject 3.6-liter DOHC V-6 engine belting out 304 horsepower @ 6800 rpm and 264 pounds-feet of torque @ 5200 rpm. Though mated to a sole 6-speed auto gearbox, you have a choice of front-wheel or all-wheel drive. Magnetic Ride Control, which adjusts the four-wheel independent suspension as per road conditions, brings toughness and rock-solid stability to the ride. Offered as Base, Luxury, Premium and Platinum trims, the XTS boasts a massive horizontal satin-chrome grille, flanked by xenon headlights, while sitting on huge 20-inch wheels. It’s all about the CUE (Cadillac User Experience) when you step into the sumptuous and spacious cabin. An 8-inch touchscreen in the center stack includes capactive controls, haptic feedback, gestures and voice recognition. Throw in the 12.3-inch reconfigurable instrument cluster into the mix and you have an infotainment system that should be the envy of the competition. Also standard are 10-way power front seats, tri-zone auto climate control, wood trim and leather on the steering wheel, console, center stack and instrument panel, dual sunroof, power trunk, rear sunshade, and a rake-and-telescopic steering column. Standard safety features on the Platinum model include 10 way airbags, four-wheel antilock brakes, blind-sport and cross-traffic alert, lane departure and front-collision warning systems, front/rear ultrasonic parking assist, stability and traction control and rearview backup camera. 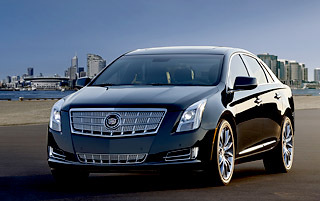 Though hefty for a sedan, the XTS is wickedly fast, nimble and a blast to drive. It’s a perfect blend of luxury, technology and sportiness. The only hurdle could be the steep price tag. The Buick renaissance continues with an all-new Verano Turbo version of its compact sedan and a redesign inside out of the Enclave SUV. Also coming up early next year is the all-new Encore crossover. But more about that later. The performance-oriented model of Buick’s smallest car boasts a smaller direct-injection and continuous variable valve timing engine but with more power and a turbocharger. Its flex-fuel 2.0-liter inline-4 cylinder engine cranks out 250 horsepower @ 5300 rpm and 260 pounds-feet of torque @ 2000 rpm. A 6-speed auto gear box is standard but a 6-speed manual also is available at no cost in this exhilarating ride, which can take you from 0 to 60 in just 6.2 seconds. Standard amenities in the front-wheel-drive sedan include Bose 9-speaker audio, leather seats, rearview camera and rear park assist, 10 airbags, blind-zone alert, 18-inch forged alloy wheels and, of course, the renowned QuietTuning, which suppresses road and wind noise. 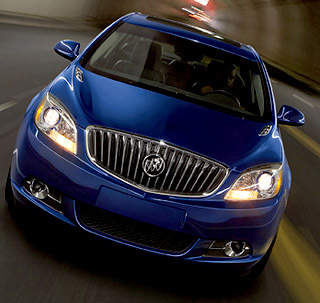 Base-priced at $29,990, the Verano Turbo touts swift acceleration, excellent handling and ride ease. This veritable performance bargain will definitely appeal to folks who relish vim and vigor in their daily drive. Since it debuted in 2008, the premium midsize crossover has been a huge success story for Buick (last year’s sales topped 58,000). But the GM luxury division has refused to rest on its laurels and restyled the Enclave with a new hood, black-chrome waterfall grille, fenders, LED daytime running lights, headlamps, front/rear fascia and chrome body side moldings. The cabin gets a revised instrument panel and door trim with ambient lights, and new center stack and climate controls. However, Buick has retained the 3.6-liter V-6 engine, which belts out 288 hp @ 6300 rpm and 270 pounds-feet of torque @ 3400 rpm. The standard 6-speed auto transmission has been tweaked. While nixing the base trim, the luxury division has kept Convenience, Leather and Premium models in the front-wheel or all-wheel-drive SUV. It is in the passenger and cargo department that the Enclave outshines the competition. You can stick with the standard second-row Captain’s chairs or opt for the second-row bench seat to get a total capacity of eight. Just pull a lever and the second row moves 3 inches fore and aft. There also is an under-floor cargo area and well-placed bins and cubbies. Add in a decent tow capacity of 4,500 pounds and now you are talking! 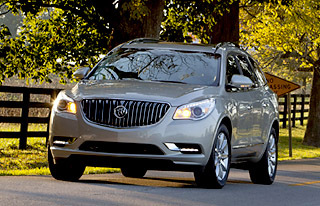 Priced at $39,270, the revised Enclave is an impressive package of power, luxury and comfort. It’s a fitting family hauler as long as you are willing to overlook the average gas mileage. For long, the word ‘wagon’ has been taboo for carmakers. 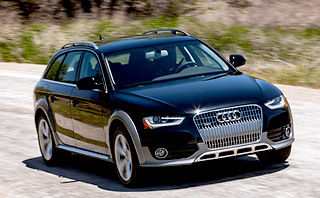 But Audi is more than happy to label its all-new Allroad by the designation. Till 2005, the well-known ride was made as a variant of the larger A6 sedan. It returns to replace the A4 Avant wagon with 2013 with a wider, taller, longer wheelbase. Under the hood sits a 2.0-liter turbocharged and direct-injected inline-4 cylinder engine developing 211 horsepower @ 4300 rpm and 258 pounds-feet of torque @ 1500 rpm. The power train enables the car to scoot 0 to 60 mph in 6.5 seconds with a top speed of 130 mph. A slick-shifting 8-speed tiptronic auto transmission is standard. Best of all is the renowned quattro permanent all-wheel drive to provide peace of mind in any road situation. It helps that the lighter electromechanical power steering is eager to change directions when you turn the wheel. For a wagon, the steel unibody Allroad is aggressively styled with the familiar but enormous Audi single-frame grille flanked by slender halogen headlights. Premium materials such as aluminum trigon inlays and black lacquer instrument panel are plentiful and impeccable attention to detail is evident. Cargo capacity is expansive at 27.6 cubic feet and, with a flipped second seat you get a worthy 50.5 cubic feet. Though EPA estimates are 20/27 mpg, we beat both the numbers during our weeklong test drive by eking out up to 33 on highway and averaging low 20s in city. Base-priced at $39,600, the options quickly add up to take the cost well over $45,000. The surefooted Allroad is a pleasant, rewarding and useful vehicle to drive with an accommodating cabin and decent fuel economy. And you won’t be wary to tell folks that your ride is indeed a wagon. 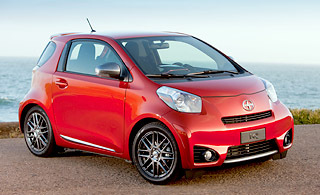 To say that the all-new iQ from Scion makes little sense would be an understatement. Agreed, the fuel-sipping subcompact is quick on the go and easy to park in a tight spot. But then the buck stops. Available in just one trim, the iQ gets a 1.3-liter DOHC inline-4 cylinder, which puts out 94 horsepower @ 6000 rpm and 89 pounds-feet of torque @ 4400 rpm. It is mated to a loud continuous variable transmission. You can drive the car in either regular drive or S (sport) mode. Suspension is handled adeptly via a MacPherson strut front and a torsion beam rear. An Electric Power Steering provides tolerable on-center feel. Dual front and side airbags, front knee airbag, side curtain airbag, rear curtain airbag, stability and traction control systems, antilock brakes and tire pressure monitoring system are standard. Ensconced on 16-inch wheels are noticeable halogen headlights with a centered Scion emblem and iQ etched below. The passenger compartment can at the most hold three adults but the fourth in the folding 50/50 rear seat behind the driver would need to be a child. Before you get too comfortable, the car doesn’t have a trunk or a glove box. There is a hidden bin under the front-passenger seat for personal valuables. Amenities include air-conditioning, four-way front seats, tilt leather-wrapped steering column, 160-watt Pioneer sound system, remote keyless entry and a driver information center. Though EPA estimates 36 city, and 37 highway or combined mileage, we eked out merely 32 mpg average in our weeklong driving. This meant having to fill gas in the 8.5-gallon tank every 170 miles or so. And though base-priced at $15,265, the car can top over $17,000, which is higher than some of the roomier subcompact four-seaters on the road. If you travel lightly, frequently and closer to home, and can ignore a noisy cabin, the affordable iQ may be worth a test drive. But personally, it failed to sway us.